Kardashian who? I’ll show you a REAL woman! 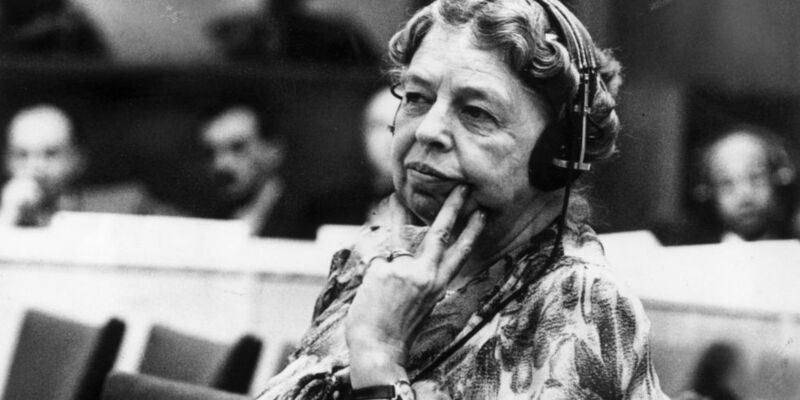 This week’s article is a break from the local philanthropy series in order to spotlight someone who is overwhelmingly inspirational- Eleanor Roosevelt. If you have not yet watched the Ken Burns documentary The Roosevelts; An Intimate History– you should. First Ladies have traditionally aligned themselves with very personal and important causes. Louisa Adams was among the first to advocate for women’s rights. Fast forward to when Nancy Reagan coined the phrase “Just Say No” as her endorsement of the D.A.R.E. program and the War on Drugs. Today, Michelle Obama has her own war against childhood obesity. However, no other comes close to the dedication displayed by Mrs. Anna Eleanor Roosevelt. Wife of Franklin Delano Roosevelt, she not only kept pace with her husband’s achievements but, arguably, exceeded his impact. The often shy and awkward niece of Theodore Roosevelt showed great bravery in the face of adversity. Eleanor was born to Teddy’s younger brother, Elliot Roosevelt, and the beautiful socialite Anna Hall on October 11th of 1884 in New York City, New York. Tragically, by the age of 10 Eleanor had lost her mother, her father, and her not-yet five-year-old brother leaving herself and the remaining children in the care of her Grandmother Hall. At the age of 15, Eleanor was sent to the prestigious boarding school Allenswood Girl’s Academy in England; there Eleanor met Marie Souvestre. Her time spent with Souvestre filled her with the confidence that would resound throughout the years. Furthermore, Eleanor was exposed to Souvestre’s open political views on protecting the rights of the working class people. Although Eleanor felt the happiest at the Allenswood Academy, three years later she was summoned home by her grandmother to make her social debut. During this time, she became involved with the Junior League comprised of philanthropic socialites. She began to teach at the Settlement House, a community center on Rivington Street in the lower East Side of New York City. In addition, she volunteered as an investigator for the Consumer’s League where she visited the dwellings of the workers and toured working conditions of the shops. She worked tirelessly to promote the fair treatment of these workers by writing open letters to the newspapers as well as press releases. In 1903, Eleanor met Franklin D. Roosevelt and when they married two years later it was her uncle, President Theodore Roosevelt, that gave away the bride. The next two decades would bring five children, the offices of Senator and then Governor of New York for Franklin and then, devastatingly, polio. Eleanor dedicated her life to the physical and political success of her husband. 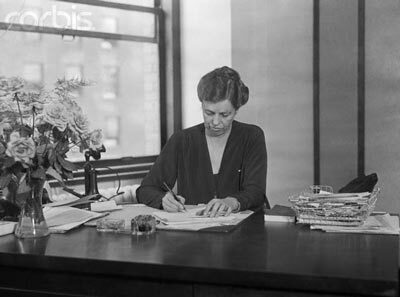 Eleanor remained a busy woman; initially, by volunteering as a member of the Board of Directors, then as Vice president, City Planning Department chair, and also Finance Committee chair for The Women’s City Club of New York. Later, she worked closely with The Women’s Trade Union League as well as the Women’s Division of the New York State Democratic Committee and The League of Women Voters. In addition, she also worked with the World Peace Movement and Bok Peace Prize Committee. As if that wasn’t enough, in 1926 Eleanor co-founded the Todhunter School for Girls in New York City; she also taught history and government. Eleanor even managed to find time to write books as well as articles and columns for publications such as the New York Times,Redbook, Good Housekeeping, Reader’s Digest and Literary Digest- just to name a few. She also lectured across the country and even came to be a popular radio commentator. In spite of the odds, Franklin won the Presidential election in 1933 and Eleanor then dedicated herself to the position as First Lady. In this role she would host countless tea parties and entertain thousands of guests. Additionally to her social duties, she would find time to write an article a day for the newspaper column, “My Day”. As First Lady, she acted in an unofficial capacity as an Administration representative dealing with political issues. She visited veterans of WWI and took their grievances to heart. She continued to use the media as a resource and constantly wrote about issues that were dear to her. Eleanor also actively campaigned for women’s rights and for the equality of races. After that she helped create the National Youth Administration, an organization that offers grants for college students. After the death of her husband in 1945, Eleanor left the White House and retired, for a short time, to the family residence in Hyde Park. Fortunately, retirement did not seem to suit her well and she accepted the position as an American spokesperson to the United Nations. She remained very much active in the role until her death in 1962. Whew, that is quite a legacy! Sadly, this article contains only a fraction of what Mrs. Roosevelt has done for our country and for humanity. She is truly one of the greatest humanitarians that has ever lived and an inspiration to all. One can only wonder what our country would be like if all the young girls (and boys) knew the life of Eleanor better than the latest Hollywood celebrity. Eleanor Roosevelt never let obstacles stand in her way, so why should anyone else? Even coming close to her level of philanthropy may be difficult, however, taking the first step is not; it’s as easy as sharing this article.